After a really long time, a movie is compelling me to write a post, solely about it. I know that I am the millionth person writing about it, but I just could not stop myself. But before I continue, let me tell you that I did not love the movie. I liked it, a lot. I sure was impressed by it, but somehow felt that it was incomplete. I know I'm going to get a lot of hate mail or comments about this, but this is my honest opinion about the movie. The movie was wonderful in its own way, with aptly cast actors and an exceptional screenplay. The underplayed humor, the screaming silence, the emotions welling in the eyes are beautifully executed. 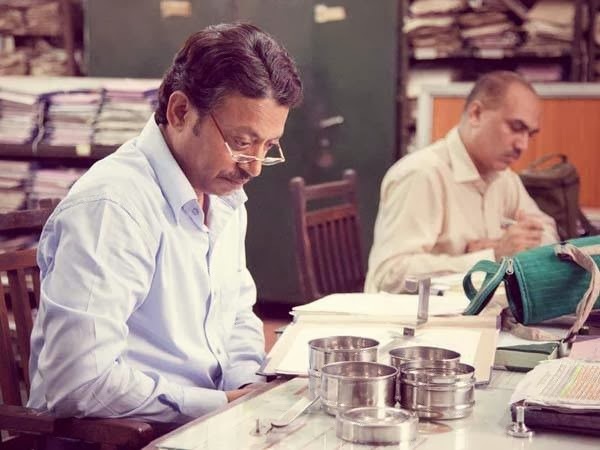 Ritesh Batra - An almost unknown director comes out with a near masterpiece that would certainly tug a cord in the coldest of hearts. Is it good enough to be sent to the Oscars? Yes. Considering the other choices made until now (read 'Paheli' and 'Eklavya'), 'The Lunch Box' has already won the Oscar in my head. 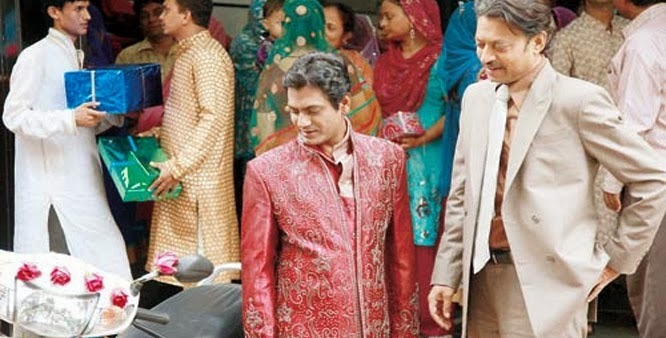 The Gujarati movie 'The Good Road' seems to be causing trouble for it I hear. I haven't seen it, so I would not comment on it. Back to 'The Lunch Box'. This is what I would call reality cinema. That is what impressed me the most. The story flows at its own pace leaving the audience to drink in the poor but effective ambiance. The opening shot of the leading lady is when she is getting her daughter ready for school. Messed up hair and untidy clothes. Who would have thought of this? Nimrit Kaur perfectly cast as Ila, the ignored house wife, manages to hold her own in a story over shadowed by Irrfan Khan as Saajan Fernandes. His face tells an entire story in itself. 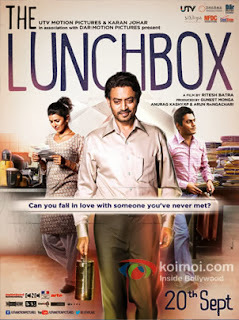 We all know that the story is about a wrongly delivered lunch box and how the leading pair exchange notes through it. Instead of dwelling much into the story I would like to talk about the environment in which it is based. And the mind blowing characters. The House wife: She is clad mostly in cotton salwar kurta's, sans a dupatta. Which is obvious because the veil is more often than not an hindrance to the constantly working house wife. I liked the fact that she changes back into the same clothes that she wore in the morning once she comes back in the evening after picking up her daughter and meeting her mother. Her eye brows haven't been shaped in months and it shows. She hardly has any make-up on her face and dresses up only when she expects her husband to compliment her on her cooking. The disappointment in her face is very evident when he doesn't notice it. When she finds out that her husband is having an affair by smelling his clothes, she doesn't react in surprise. She just accepts it, almost like she had always known but chose to live in denial. She doesn't even confront him. When she tries to entice her husband into bed to conceive another child, she dresses up in an old garment that she wore on her honeymoon, hoping to trigger some feeling in him. Doesn't work. The kurta she wears is white, but the bra underneath is black. Which is right, because it does not matter for a house wife. She walks away in disappointment feeling the clothes hung in the passage, checking if they are dry or not. This, is the perfect house wife. The widower: He hardly talks and reeks of loneliness and monotony. His dusty balcony where he smokes standing at the same spot, wearing the same house clothes everyday, overlooking the big fat happy family dinner scenes in his opposite building. The unsaid pain in his hands as he empties a plastic packet filled with dal into a bowl gets to you. The emptiness in his eyes and his slavery to routine shows in every frame. This is until he receives the first letter from Ila. After that, the change in him is obvious. He even begins to smile. The Lunch Box could be about anybody. A busy husband having an affair. A lonely house wife talking to a never seen neighbor. An over enthusiastic fresher trying eagerly to impress the senior he has to replace. The innocent daughter playing with a lone toy. A frustrated mother taking care of her sick husband. A lonely man behaving rudely with kids, because he has never had any. I mean, if this is not real then what is? Almost every scene in the movie triggered an emotion in me. But these are my favorite scenes in the movie. They are simple, honest and realistic. ~ Ila's laugh, when she reads the letter where Saajan mentions that someone touched him in the train. Down there. ~ Saajan's feelings in his eyes when he lays his eyes on Ila for the first time. Without letting her know that he was around. ~ Ila's mothers dialogues when her husband passes away. This is very true and hard hitting. ~ Saajan's smile when he sees the cooked aubergines in the lunch box. His favorite. ~ The dabba waala talking about the Harvard waala. ~ Shaikh's happiness regarding the scooter that his in laws are giving him. ~ The pride in Saajan's voice when he calls Ila his girlfriend for the first time. ~ The shock in Saajan's face when he hears that a woman jumped off a building with her daughter, and the relief on his face when he smells his lunch box that day. ~ His restlessness when he doesn't smoke for a day on Ila's insistence. ~ The mehendi stain on Ila's nails. ~ The desperation in Saajan's face when he sits with the dabba waala's in the train. WOW! No other movie has been this real until today. The movie is confident and stays with you from frame to frame. The direction is fantastic and the movie sticks on to its soul till the end. This is simplicity at its best, do not miss this movie. I think I have something to watch now. Please do, you won't regret it. Thanks to being a first time touch screen user and having long nails, I touched the delete button instead of publish on two comments :( . Not wanting to waste the time these brilliant people invested in posting a comment I am going to copy them from my mailbox here. MUST WATCH...Read so many good reviews on it! - Red Handed.